It's also a homecoming for John Mercanti, 12th Chief Engraver of the U.S. Mint and renowned designer of coins, including the reverse of the beloved United States Silver Eagle. A true celebrity in the coin world, mention Mercanti's name among collectors and you'll receive instant recognition. But, it turns out that Mercanti is also a massive comic book fan! When the opportunity to design a coin for "Spider-Man: Homecoming" came up, John cleared his work schedule just to work on this "dream come true." 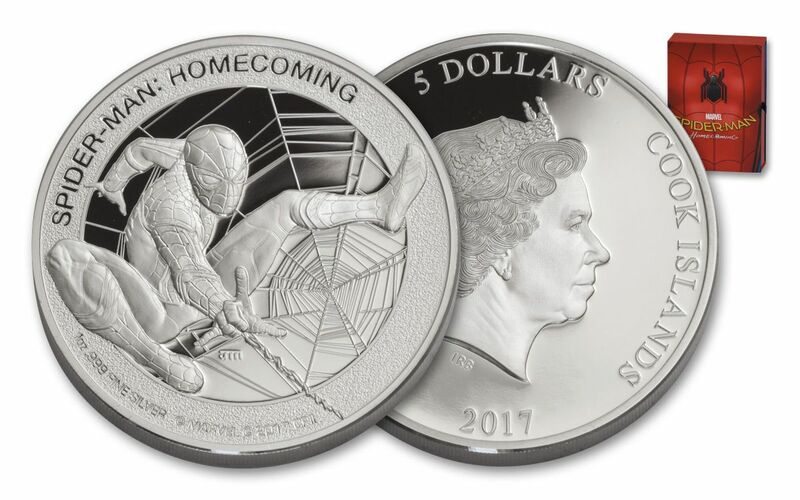 Now, the superhero of coin design has completed this gorgeous passion project -- introducing the 1-oz Silver Spider-Man: Homecoming Proof! Minted in 99.9% Pure Silver, This Proof Will Have Your Spidey Sense Tingling! With Spider-Man in full web-slinging and sky-swinging form, John Mercanti's design brings Peter Parker's alter ego to life in one ounce of 99.9% pure silver. The action is all set against an intricate spider web background and wreathed with the title "Spider-Man: Homecoming." 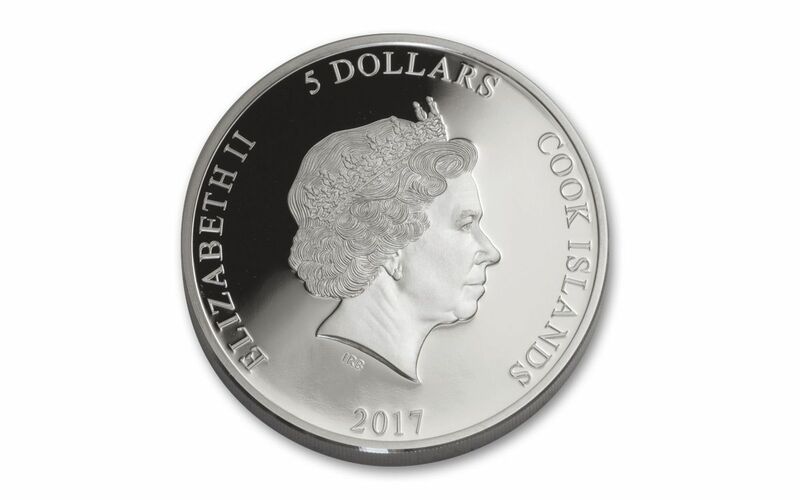 Flip over this legal tender five dollar Cook Islands coin to find Ian Rank-Broadley's portrait of Her Majesty Queen Elizabeth II. Proof-minted using polished dies, multiple strikes and hand-selected planchets, this coin shines with mirror-like surfaces and razor-sharp details. 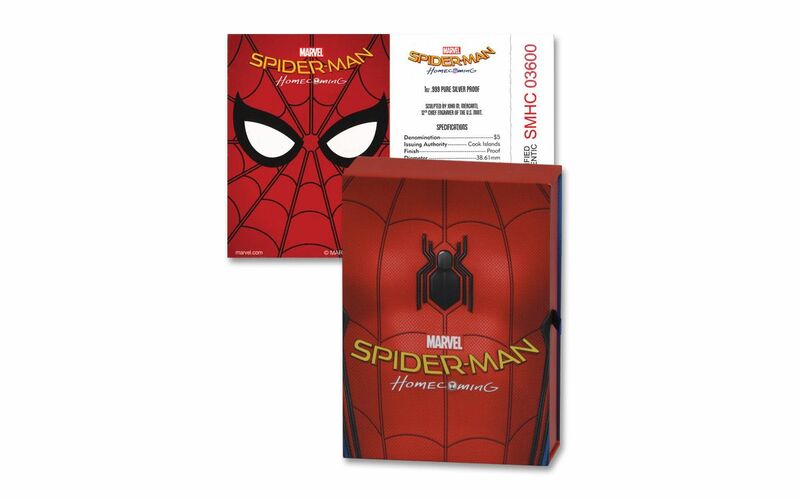 An official Marvel Release, your 1-oz Silver Spider-Man Proof will arrive along with a numbered certificate of authenticity. Spider-Man has been fighting crime for over 55 years, catching countless fans in his webs. But, only 5,000 of these 1-oz Silver Spider-Man Proofs will be minted for Spidey's global audience. And, with 2017's newest adventure, we're expecting Spider-Mania to make quick work of these proofs! Don't wait another second -- do whatever you can to sling this proof home today!